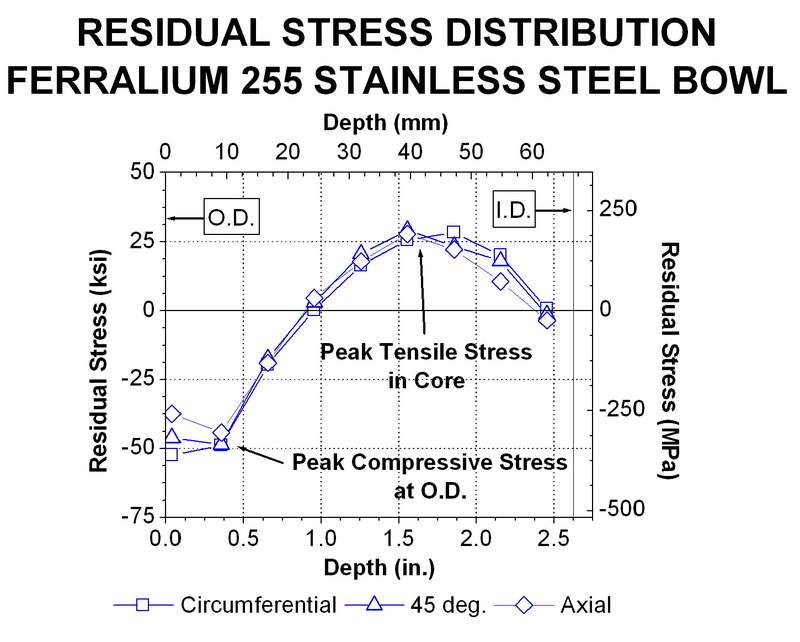 The ring core technique is a mechanical method used to quantify the principal residual stresses as a function of depth. Ring core is based upon linear elastic theory and consists of dissecting a circular plug containing a strain gage. The change in strain is monitored by an on-line computer as a function of cut depth. The ring core technique can be used on metals, ceramics, and polymers, where linear elastic theory can be assumed. Lambda has several ring-core residual stress measuring systems that allow for testing both at our facility and in the field. Mechanical techniques, which involve removing material and monitoring strain relaxation, can often provide the only means of determining residual stresses in coarse grain components. 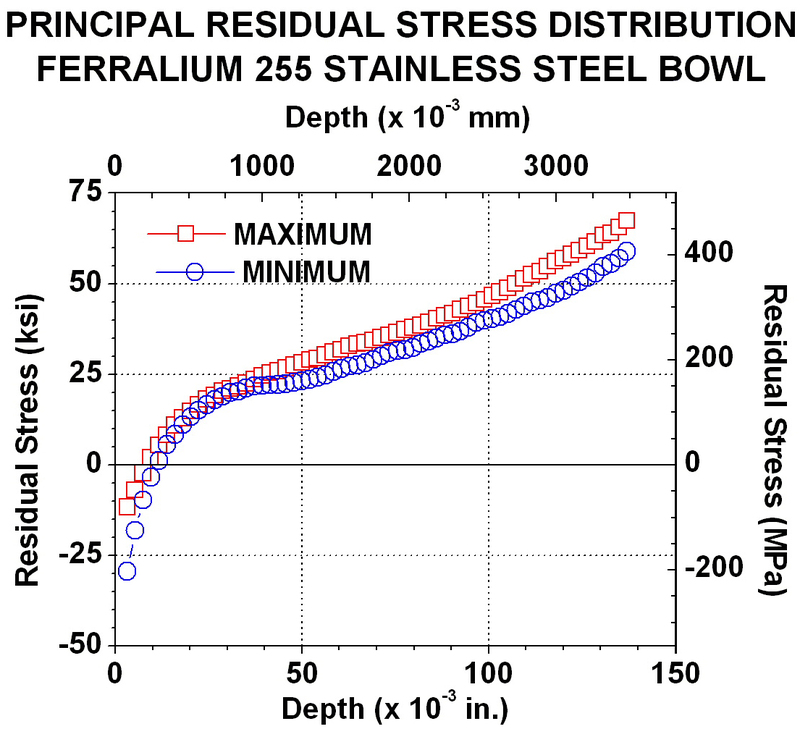 Mechanical methods of measuring residual stress are often a more cost-effective and efficient means of determining deep residual stresses in large castings or forgings. They also allow determination of the principle residual stresses as a function of depth. Not limited to residual stress measuring up to only 60% of the yield strength. Less sensitive to errors involved in placement of cut. Less sensitive to residual stresses induced by creating cut. Able to measure deep residual stresses. Lambda has automated the ring core residual stress measurement method by interfacing a personal computer to a plunge-type electrical discharge machine (EDM) or milling machine. The ring core process is controlled with a data collection software package developed and written at Lambda. Both the depth of cut and the strains are monitored and recorded. The software allows the technician to enter ring core parameters specifically chosen for each application. Data reduction software, also written at Lambda, is used to compute the principal residual stresses as a function of depth. The maximum depth to which the residual stresses can be determined is a function of the inside diameter of the electrode. Larger diameter electrodes allow deeper residual stresses to be measured. To discuss your residual stress measurement needs please contact us by calling (800) 883-0851 or by email here. For additional information on the measurement of residual stresses using the ring-core technique, see Lambda Diffraction, No. 31 and Diffraction, No. 35.